Jerry "Woody" By: Jerry "Woody"
An "X" prefixed commercial trailer plate. 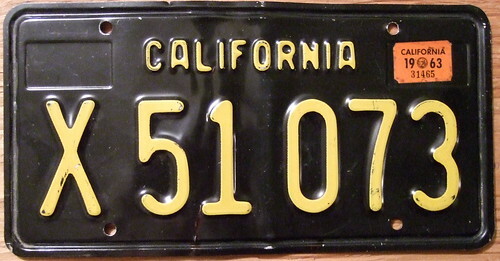 What is unusual about this plate is that it was issued a 1963 sticker over the debossed "63". Didn't think California issued a 1963 dated sticker as that was the year California replated with yellow on black plates like this one with a three number, three letter format. All these plates had a debossed "'63" in the upper right sticker navel and were not issued stickers until 1964. Thanks to MR38 and this plate in my collection I know that this plate type and perhaps others were issued stickers for 1963.